I think the fact that i bought the new BRAN flakes cereal! 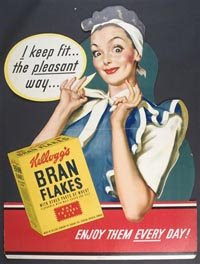 proves that im a sucker for advertising and for trying something new.. a big sucker... i mean bran flakes?! i really really did believe they would be 'delicious'.. i must have thought finally a high fibre cereal thats coated in sugar! Theyve finally figured that cereal can have high fibre and high sugar ROFL! When broken down in your mouth it feels gritty, no doubt because of the bran.. it sticks to the top of your molars worse than dry wheat bix. Don't feel bad.. you're not alone. I always get some sort of a *buzz* buying a new product - and I get sucked in by advertising too. I do like Weight Watchers new "Potato Bakes" in the chip aisle. 6 packets (in a long bag) for $6-ish.. so expensive.. I've so far only tried salt n vinegar..and I like them. Not overpowering at all. Are the hightlighted All Bran varieties one's that you're interested in? Or just one's you found on Wiki? Those Bran Buds are akin to tablespoonfuls of laxatives I think.. Where is the 'zing' and excitement? When I was in the USA I was fascinated how they had a wider range of products.. like the brand name BAND-AID's.. so many more colourful one's and character one's..and cheaper than here. Same with board games.. so cheap..and more variety. Though not everything is good! I have been known to buy products..and then throw them out if they fail me..(normally food) and I get down on myself for wasting 'x' amount of dollars I spent on the item. p.s. re: the chocolate All Bran.. I bet they're not good either.. Consumers get sucked in with words .. like "almonds" and "honey"..but your experience is proof that the cardboard flavour predominates. is there a emergency exit?